Amazon just announced a new Android app with everything you can find in the normal Amazon app as well as a revamped store for Android apps and games. While the company already had the Amazon Appstore, Amazon Underground is a brand new app that can potentially replace both the Amazon app as well as the Appstore. In particular, the new app lets you download premium apps for free. Here’s how it works. 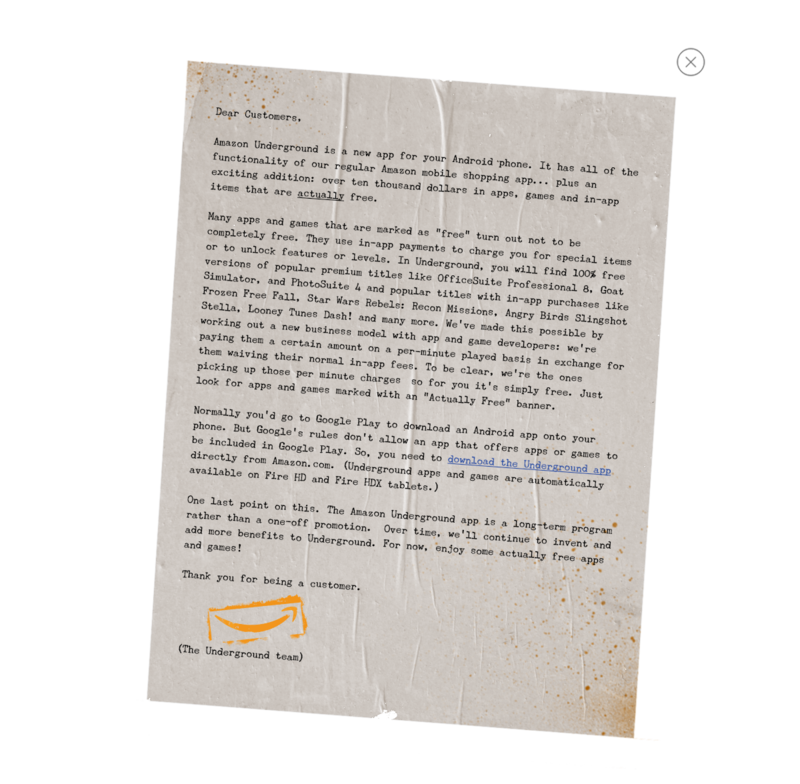 Amazon has partnered with thousands of developers to make “over ten thousand dollars in games, apps and in-app items” actually free. These apps are usually paid apps, but Amazon found another way to compensate the app developers. For example, you can already find OfficeSuite Professional 8, Frozen Free Fall, Star Wars Rebels: Recon Missions, Angry Birds Slingshot Stella and more. These apps will be branded as “actually free,” and it replaces the free App A Day program. The company pays developers based on how long you use a certain app. Amazon monitors per-minute uses while developers waive in-app purchases and upfront costs. Amazon has already tried this strategy with the Kindle Unlimited subscription service — the company pays royalties to writers based on how many pages you read. It is basically the same thing with Amazon Underground, except with Android apps. This model is also reminiscent of music streaming services, such as Spotify, Apple Music and Rdio. In the Amazon Underground app, you will also find paid apps, freemium apps as well as physical and digital goods. The entire Amazon Appstore catalog moves to the Amazon Underground app. The only addition is the “actually free” program. Google doesn’t allow competing app stores in the Play Store, so, just like with the former Amazon Appstore, Amazon customers will have to download the Amazon Underground app directly from Amazon’s website. That’s why the traditional Amazon Shopping app will stay in the Play Store as well. And of course, Fire HD and Fire HDX users automatically get access to the revamped Underground store. Finally, Amazon says that the “actually free” program isn’t a one-off promotion and that the company is committed to this program. If developers are happy with Amazon’s compensation, it could be a great way to make Android users move away from the Play Store and switch to the Amazon’s app store. Amazon Underground is an interesting move for a couple of reasons. When the App Store launched in 2008, the most popular apps were paid apps. Over the years, there has been a big race to the bottom as big app publishers launched popular free apps and small publishers tried to game the top charts by temporarily making their apps free. This trend was even worse on Android as many users didn’t want to pay a dime for an app. App developers had no choice but to rely on banner ads to support their apps. In 2009, Apple allowed in-app purchases for free apps, and it basically shaped the App Store and Play Store as we know them today. Now, free-to-play games are the top grossing apps on both Android and iOS, with Game of War, Clash of Clans and Candy Crush Saga on top of the charts. Angry Birds maker Rovio may not survive with this new landscape. Yet, customers are fed up. Micro-transactions, paid upgrades and waiting time are the new normal. Amazon is surfing on this trend with “actually free” apps, saying that you won’t find even a hint of in-app purchase in the “actually free” apps. Now, let’s see if Amazon can get big-name developers on board and attract new users to its Play Store competitor.